Our Fraser Fir Christmas Trees will be the centerpiece of your holiday memories! Known for their excellent needle retention, sturdy branches, strong aroma, and blueish-silver needles, the Fraser Fir is considered to be the most exclusive Christmas tree grown in North America. Our trees are grown in the most environmentally responsible manner possible without the use of harsh herbicides, pesticides, and synthetic fertilizers. 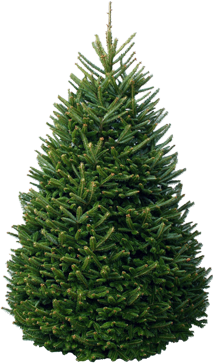 Our Fraser Fir have been carefully grown and sheared by hand, to ensure heavy density and a picture-perfect shape that meets or exceeds the USDA standards in all categories. Delivery - Delivered to the outside of your home or office. Delivery + In Home Setup - Delivered and setup in your home or office. All tree are fresh cut upon delivery. Select a tree size and add to your appointment. Orders must be placed 24hrs in advance. Log in to reschedule your delivery time slot up to 24 hours in advance.